Home Editorials The Tyron Woodley Sweepstakes: Did Kamaru Usman Just Pass Colby Covington? 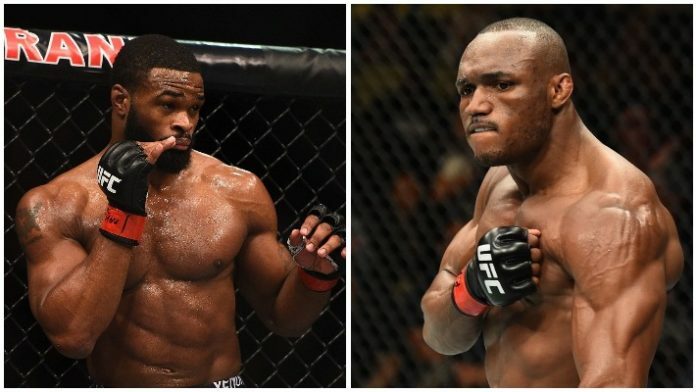 The Tyron Woodley Sweepstakes: Did Kamaru Usman Just Pass Colby Covington? We all thought the UFC welterweight title picture was figured out, but after this past weekend’s TUF 28 Finale main event, it’s hard to say at this point what will happen. It was assumed UFC welterweight champion Tyron Woodley would be fighting Colby Covington in early 2019, with UFC 233 in January rumored as the target date. But after Kamaru Usman’s dominant win over Rafael dos Anjos at the TUF 28 Finale, there’s no telling which of Usman or Covington will win the Woodley sweepstakes. Due to all the drama and trash talk Woodley and Covington have been getting into over the last few months ever since Covington beat RDA back at UFC 225 to win the interim welterweight belt, it was assumed “Chaos” would be next in line for “The Chosen One.” Not so fast. An injury to his nose meant Covington couldn’t fight Woodley at UFC 228 back in September and Woodley instead fought Darren Till, beating him by submission. The fight game is all about timing, and it appears Covington may have missed his chance to get a title shot because Usman might have stolen it with the one-sided win over RDA. Although UFC president Dana White said earlier last week on the UFC Unfiltered podcast that the promotion was still planning on having Woodley fight Covington, after Usman’s violent victory over RDA the president changed his tune and he now says “The Nigerian Nightmare” may jump in line. And it’s hard to argue against it. Yes, Covington is 9-1 in the UFC and that record should be good enough to get anyone a title shot, but Usman is 9-0 and hasn’t lost inside the Octagon yet. Based on their head-to-head performances against RDA, you can see why the UFC is thinking about bumping up Usman against Woodley. Although Covington beat RDA, he essentially neutralized him against the fence and it was a pretty dull fight. Not only that, but it was pretty close and Covington had to edge out a couple of close rounds to take home the interim title. Usman, meanwhile, absolutely beat down RDA from bell-to-bell in both the striking and grappling departments. This fight wasn’t even close. We all know the UFC brass prefer striking to grappling, and Usman’s improvements in his standup might be just what the doctor ordered. If he had just laid down on RDA and wrestled him for five rounds, we may not be talking about a possible title shot for him. But even though he didn’t get the finish against the durable RDA, the fact he showed off such improved striking might lead the UFC matchmakers to believe he has a better chance at beating Woodley. While Covington would likely sell the fight against Woodley better just based on his ability to be a troll, he’s still unproven as a pay-per-view draw. Usman isn’t at Covington’s level on the mic, but he’s improving his trash talk game and the UFC may feel like he sells the fight against Woodley just as well as Covington would. Ultimately it all comes down to timing. We don’t even know when Woodley will fight again, or who he wants to fight. If we had to guess, he’d likely say neither Usman or Covington deserve a shot at him, but the UFC will make him fight one of them. We don’t know if Covington is ready to come back yet, either. At this point, you have to wonder why the Woodley vs. Covington fight hasn’t been booked and what the problem is there. Although we all assumed it would be Covington next in line, a dominant main event victory at the TUF 28 Finale by Usman may change the UFC’s thoughts on that happening. It seems like White is already thinking about making a switch and giving Usman the next crack at the belt, and based on how amazing he looked against RDA it’s hard to argue against that. Based on merit, both Covington and Usman deserve to fight for the UFC welterweight title, but only one will get the fight. With the UFC announcing new cards for 2019 left, right, and center, you’d have to think we’ll know more about the welterweight title sweepstakes soon. One fighter is going to be passed over, and we’ll hopefully soon find out who that is.